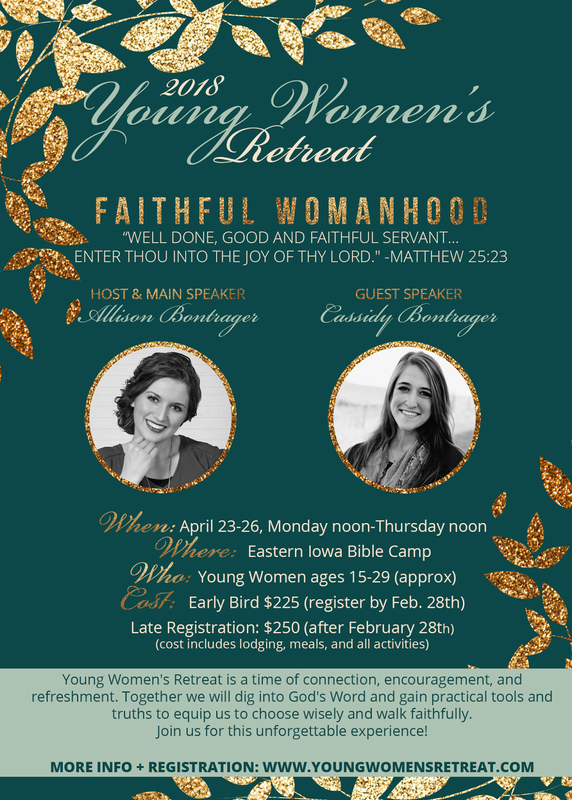 Allison is hosting another Young Women's Retreat!!! 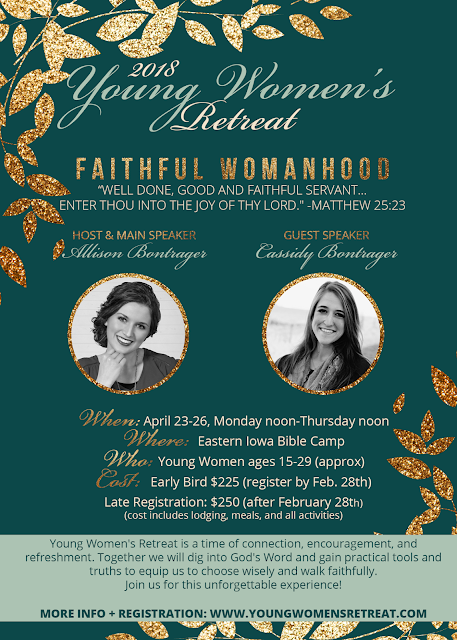 If you would like to attend an encouraging, inspiring event AND enjoy fellowship with other Christian young women, this Retreat is for you!!! Allison goes all out to provide a refreshing + uplifting atmosphere where you will experience challenging teaching, good fellowship, delicious food, and more. Joshua's wife Cassidy will be the guest speaker, and you don't want to miss her powerful + practical talks. In addition, you will hear several sessions from Allison, be part of a "small group" for times of discussion + prayer, have worship times with the entire group, and enjoy lots of free time to relax, have quiet time, and make new friends. Visit Allison's Blog to read her invitation post. Visit the Retreat website for more information, FAQs, and registration. PS: While this event is primarily for single gals, married young women are welcome to attend as well. Cassidy (obviously married:) will be there, and we would love to have some of you young married ladies join us, too! Our February tour schedule finds us in South Carolina, Georgia, and Florida. If you live nearby we would love to see you at one of our concerts! The first week of the 2018 Winter Tour has been jam-packed with services. We have covered a lot of ground; first we had concerts in Missouri, Arkansas, and Tennessee, and finally we ended up in Alabama for four days of ministry in the prisons. 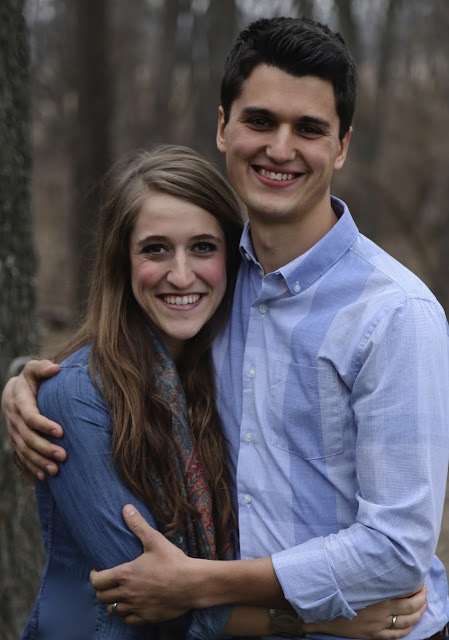 We are thrilled to have Joshua and Cassidy touring with us! Joshua is our music manager, as well as assisting in a variety of other areas, including secretary work. Cassidy helps Joshua in his work, as well as singing and playing guitar and violin with us on stage. In their spare time they love to go on vigorous runs + walks together, and read, study + discuss all manner of things. Rebecca and Cassidy, all ready for a concert! Chelsy and John drove several hours to see us one evening. We enjoyed every moment with them! We miss Chelsy so much, but are thrilled for this new season as she starts her new role as wife. Denver has been assisting with tutoring the three youngest, and he recently started a weekly history class with them. They are currently learning all about Greece and Persia. Allison and Rebecca, ready to sing. One day before a prison service, we, along with the Bowers family, had the privilege to meet with former Chief Justice Roy Moore. We were inspired by Mr. Moore's dedication to truth and law. He is truly an unwavering man of principle and character. Thank you all for stopping by! Visit the blog every Saturday through the beginning of April for a weekly Winter Tour 2018 update. Joshua has started a brand-new blog, www.joshuabontrager.com. He will be writing on Intentional Christianity, and his purpose is, "To inspire and equip Christians to know, live, and speak the truth." 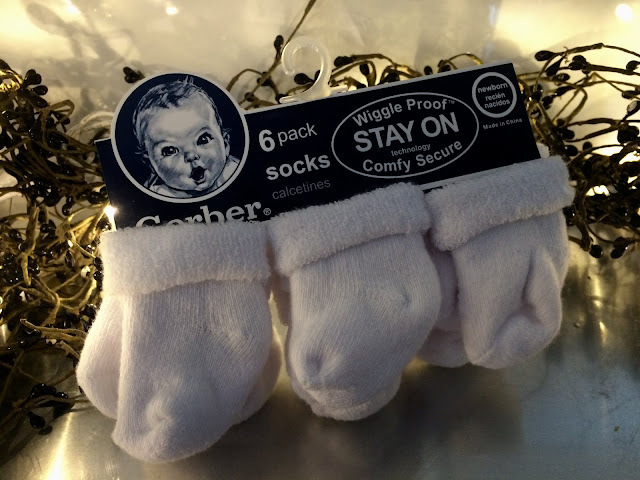 Head over to Allison's blog, here, to read a full promotional post. You can watch the blog trailer here. 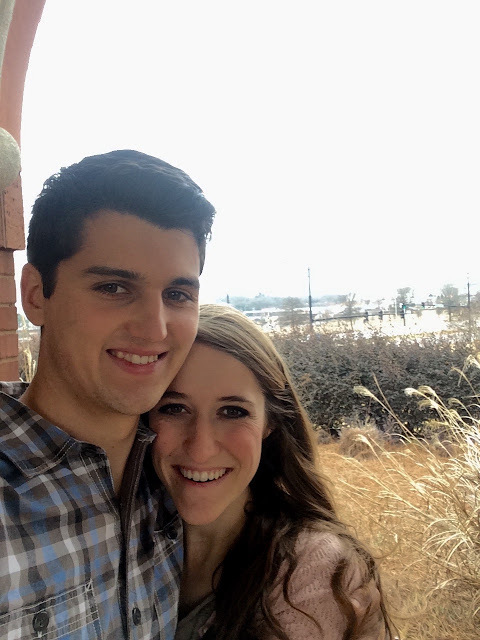 We think any Christian will be blessed by reading Joshua's blog! Since a picture is worth a thousand words, here are just a few pictures from Chelsy and John's wedding. Praying together right before the ceremony. Father + Daughter...it was a sentimental day as he gave away his firstborn, his oldest girl, his personal assistant, his beloved daughter. Our dad described it as "total peace" as he completely trusted the man she married, although he already misses her greatly. MANY big smiles on this joyful occasion!!! Dear friends traveled from near and far- in this case, Mexico and Canada! So many people made this day happen.....we couldn't every thank everyone enough for sacrificing and serving! ps. For those wanting to watch the livestream, please email johnandchelsy2017@gmail.com with your request. It is once again time to hit the road traveling! Here are the tour dates for this January. If they are near any of you we would love to see you! Life has been crazy lately with a wedding, two big New Years celebrations, numerous out of town guests, subzero temperatures (which means lots of extra work on the farm), family jam sessions to prepare for our Winter Tour, homeschool, normal daily work, and an injury (Denver injured his leg but is on the mend). In addition to that, we have extra work in the office and house as we wrap up many, many projects in preparation to leave for 3 months! The blog's been pretty quiet lately, both because our main blogger got married (and we haven't completely transitioned those responsibilities yet:), and because we've been pretty occupied with other things! 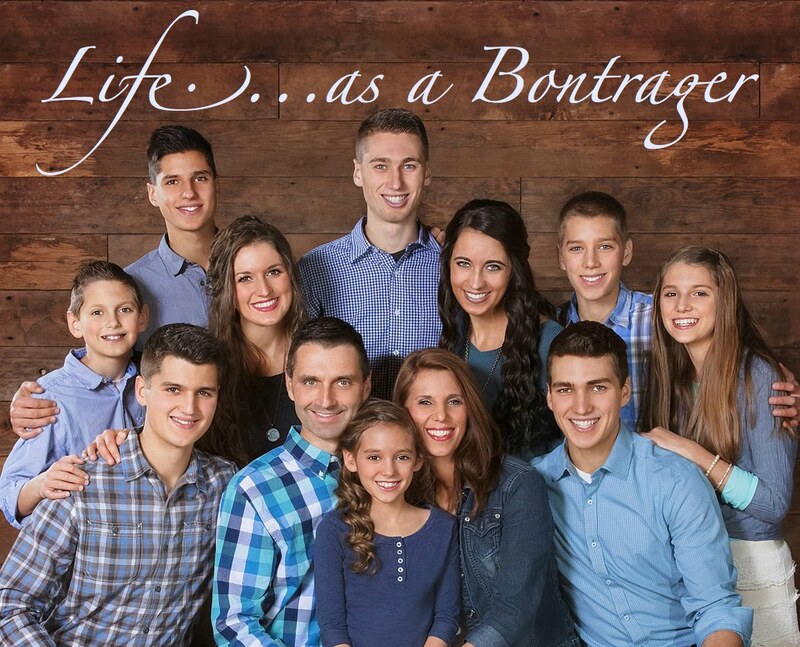 I (Allison) will be posting here several times this week, as well as sharing daily life updates over on our family instagram, @bontragerfamilysingers . We'd love for you to follow along! Wishing ya'll productive and joy-filled start to 2018! This is one of the most exciting times of our lives, and we wanted to share it with all of you, too! This morning our parents were given this envelope. It is a "New Years Gift". 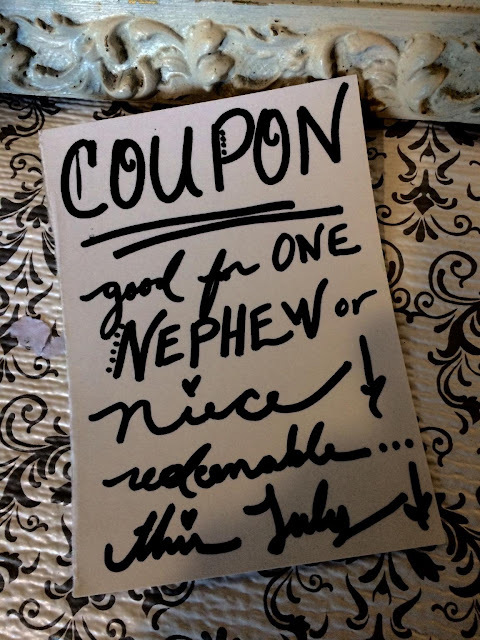 A paper was inside with this message.....revealed as it was unfolded. And these are the parents-to-be!!! 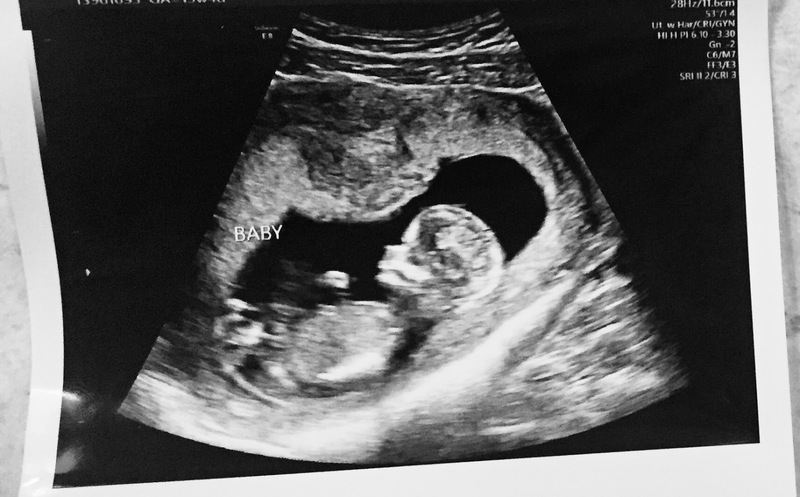 The mini Bontrager will be making his/her entrace, Lord willing, in July! This baby is already much loved and anticipated. Carson and Carolina will be amazing parents, and we are all rejoicing in this blessing. We have an exciting New Years announcement that we can't wait to share with you all!!!! Check back at 12pm to hear about our incredibly exciting start to 2018! Any guesses as to what it might be?